DISABLE push features, alerts, and notifications on your mobile devices, desktop, and laptop computers. This is the hardest step for many people. You don’t have to turn off your phone altogether, but do turn off distracting dings and vibrations when you are working or focusing on something besides the incoming emails and texts. Most people do not have the self-discipline or mental fortitude it takes to ignore an incoming text or email. But when you interrupt yourself to check what just came in, you lose time, focus, and productivity (we are going to talk about multi-tasking in the coming weeks). For now, start giving yourself the gift of being fully present with your attention wherever you are, feeling whatever you are feeling, even if that feeling is boredom (at first). Putting down your smartphone allows you to truly connect with the people who are in your presence, even if it is a checker at the grocery store that you don’t know. This will ultimately make you more productive, intelligent, and happy. I promise. Instead of willing ourselves to just check less often, we need to configure our work time so that we are tempted less often. The goal is to check email, social media, and messages on your phone just a few times a day—intentionally, not impulsively. Our devices are thus returned to their status as tools we use strategically — not slot machines that randomly demand our energy and attention. I counsel my clients to check email first thing in the morning and in the late afternoon—and that’s it. Here is the key: During those times, you’ll need to block out enough time to get through new emails, and, if possible, all the way to the bottom of your inbox. If a particular email is going to take more than 5 minutes to read and respond to, put it in a folder (“to do this week”) and add whatever it entails to a task list. If you need X hours a day to deal with your email, make sure you’ve scheduled X hours daily. On your calendar. For real. I check my email quickly before I begin my most important work to delete or unsubscribe from junk and respond to anything urgent. I respond to everything else in my email at 3:00pm. I actually block this time out on my calendar as a recurring appointment, and then move it around as necessary to make room for other meetings — that way I check strategically, not impulsively. I occasionally look at (and maybe post to) social media once in the morning before I go to my office, if I have time, and then I close it for the day. I respond to texts and voicemails once mid-morning and once mid-afternoon (between calls and meetings). 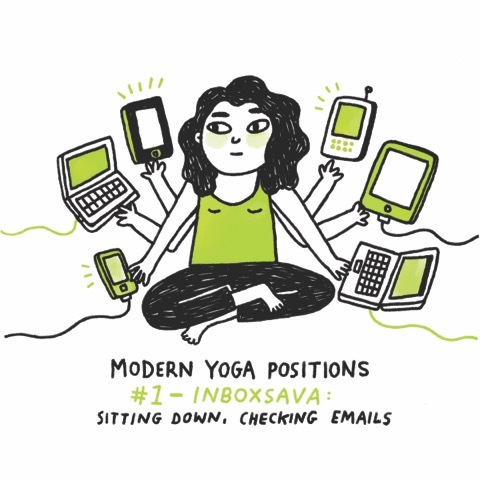 Feeling panicky at the prospect of detoxing from your email and messages so drastically? Start with very small chunks of time, or very limited spaces. Commit to unplug for just twenty minutes—at dinner, for example—or to just leave your device out of your children’s room, or do not check email before you are actually out of bed one morning per week. Often we need to give our nervous system time to adjust; we need to have the experience that our heart does not actually stop beating—or that a crisis has not erupted at work—in the few minutes that we’ve turned off our phone. (In fact, we enjoyed it! We were more efficient and less stressed!) The idea is to build internal fortitude through positive experience slowly rather than trying to massively make over our lives in one fell swoop. You know that it would be far better to stick to your priorities 95% of the time than it is to compulsively check your phone and email and feeds. But there’s a catch: Most people can’t effectively command their own time anymore. It’s one thing to want to do something besides check your email compulsively, but it is quite another to actually be able to DO this. You won’t be able to just stick to your newly prioritized task list through the sheer force of your iron-clad will. You just won’t. Let’s be clear: checking our email and our social media feeds constantly is inherently gratifying. These distractions are pleasurable because they represent the consistent promise of something new, and because they give us what researchers call “variable ratio reinforcement.” We are drawn to our smartphones in the way that we are drawn to slot machines: we never know when we’ll get a satisfying or novel message on Facebook or an email with good news, so we just keep checking. Do you use your phone like a slot machine—always hoping the next check will bring a rich reward? We humans are so darned prone to doing that. How does it make you feel? Share your thoughts in the comments. One survey found that 80% of 18-44 year olds check their smartphones within the first 15 minutes of waking up–and that 89% of younger users, those ages 18-24, reach for their device within 15 minutes of waking up. Seventy-four percent reach for it immediately after waking up. A quarter of those surveyed could not recall a time during the day that their device was not within reach or in the same room. Another study found that people tend to check their email about every 15 minutes; another found that in 2007 the average knowledge worker opened their email 50 times a day, while using instant messaging 77 times a day—imagine what that might be today, nearly a decade later, given the evidence that we spend more time checking than ever before. So we check our smartphones constantly. Is that bad? People who check their phones frequently tend to experience higher levels of distress during their leisure time (when they intend to relax). According to Peter Bregman, our success and happiness are based as much on what we choose NOT to do as what we choose to do. I wholeheartedly agree. What things in your life keep you from doing other things that you’ve identified as priorities? Which of your behaviors tend to thwart your goals? 2) Re-organized your to-do list according to your top priorities. If you have trouble with follow through, make a “NOT-To-Do” list, which is another fantastic Peter Bregman idea. So under the priority labeled “Nurture my family and close relationships,” I’ve written: Don’t go back to work after dinner if the kids are at home. I have similar “NOT-to-do” items under each priority. By being explicit about what I’m NOT going to do–by actually writing these things down–I’m increasing the odds that I’ll spend my time on the things that matter most to me. Once you’ve identified what will bring you joy, ease, strength, and meaning in your life — or how you otherwise hope to feel— it’s time to start organizing your time accordingly. Time management guru Peter Bregman, author of 18 Minutes: Find Your Focus, Master Distraction, and Get the Right Things Done, advises his clients (high-profile business leaders) to pick their top five priorities and then spend 95 percent of their time doing only those activities, saying “no” to virtually everything else. This idea made a lasting impression on me when I first heard him talk about it because I—full-time working single mom that I was at that time—was convinced that there was no way that I could spend 95 percent of my time doing things that fell into my top priorities. I was too busy just making sure the trains ran on time! But it turns out that now. To give you an idea of how this worked for me, here are my top five priorities this year, in order of importance. (2) Nurture my family, home and closest friendships. My children and husband first, extended family next, friends and community after that. This is about raising amazing human beings who are healthy and happy, and about cultivating a deep sense that I am part of something larger than myself. In order to honor this priority, I need to schedule a fair amount of family time on my calendar. Because I actually have this scheduled, I can say “no” to other things that come up more easily. I simply say that I have a scheduling conflict. (4) Coaching and speaking. As cheesy as the title “life coach” sounds, I love love love being one. Call it executive coaching if we must, but this is the professional activity in my life that consistently reminds me of my social value. I love creating coaching programs, like this one, and I love coaching individuals. Every day that I coach I get feedback that I’m helping people become happier, healthier, and more productive. So I spend time nearly every weekday coaching my clients. In addition, I do a fair amount of speaking as it is another way to do my coaching work for a larger audience. This year I’ve decided to take no more than twenty speaking engagements; more than that and the travel and energy required to speak will start to smother my other priorities. (5) Give back to our community. I serve on the board of The Thacher School and run The Backpack Project, a little family organization we’ve started to help people who live near us that are homeless. We provide backpacks (or “Care Kits”) full of supplies to the people who are homeless living in our community. Do you think you could spend 95% of your time on your top 5 priorities? When I first started thinking about my top priorities, I wasn’t even coming close to spending 95 percent of my time on them. In addition to my top five priorities, I was writing Raising Happiness, and then The Sweet Spot, and I was the executive director of UC Berkeley’s Greater Good Science Center! Spending 95 percent of my time on my top five priorities leaves only about five hours a week for other things—that other 5%, the things that aren’t real priorities, but often need to be done. Something often has to give; for me, before I made nurturing myself a priority, it was my health. Like many working parents, I used to put my own well-being on the back burner, never exercising and rarely getting enough sleep. This was not an effective strategy, as I was sick all the time. Guess what? Now I spend closer to 95 percent of my time doing something that falls into one of my top five buckets (which change every year, by the way). 5% is about 45 minutes of every waking day; that is more than enough time to get the little things done that I must. Most days, most of that 5% time is spent answering emails. How we schedule our priorities doesn’t have to be entirely proportional. We might value family most in life but spend the biggest amount of our time on some aspect of our work. So long as we are spending enough time on each of our priorities to accomplish our goals, that amount of time is enough. Deciding on your Top 5 priorities is going to REALLY free up some time for the things that matter most to you. Now it’s your turn to decide on your top 5 priorities ala Peter Bregman. Use the PDF download below as a guide for picking your priorities. You could even save it and use it again next year when you pick new priorities. Pause for a moment and think about what you want to feel more of in this one wild and precious life (as Mary Oliver would say). Don’t think about what you want to achieve or accomplish; think about how you want to feel. Shooting for the feeling-state that you want more of (maybe you want more happiness, confidence, or fulfillment) will always take you down a different path than setting your sights on a particular achievement. Emotions are more motivating—and far more fulfilling—than an achievement goal in the long run. Maybe you you really want to grow your business, but you’re too exhausted and overwhelmed right now and you need to learn how to accomplish more by doing less. An achievement goal would be to grow your business by 25%. But probably what you want to feel is successful, while at the same time feeling well-rested. One way to figure this out is to identify the activities in your life that already produce the feeling-state you are looking for. These activities don’t need to be habits or things you have done recently; they just need to be things that have produced the emotions you are after in the past. We human beings are terrible at predicting what will make us feel happy (or feel anything positive) in the future. Although we think we know what will make us happier, plenty of research shows that we tend to be wrong about what actually does. We have better success in the future when we look at what has produced the results we are looking for in the past. For example, a client of mine identified that she wanted to feel more calm, and two activities that make her feel calm are walking her dog in the morning and meditating. Having a nice long list of the tasks, circumstances, behaviors and activities that already make you feel how you want to feel is going to be handy for the next few activities we’ll introduce as a part of this online course. So spend some time reflecting on the feeling state that you are after. How do you want to feel when you find your flow? Which activities and pastimes have produced the feelings that you want to feel? Since her own bout with burn-out and crippling exhaustion, Arianna Huffington has learned to give great advice for finding greater meaning and fulfillment in life: Start working on your eulogy, and stop working on your resume. The crowning achievement of his life was when he made senior vice president. He increased market share for his company multiple times during his tenure. While she didn’t have any real friends, she had six hundred Facebook friends, and she dealt with every email in her inbox every night. After we’ve passed away, people will recount the ways that we made a difference in their lives and in the world. They will tell stories and recount memories of times we enjoyed together. They will talk, in essence, about the meaning that we found in this lifetime, about our value, our impact, and our purpose. When we start working on our eulogy, we reorient our efforts toward meaning and away from achievements. We look away from the glitter of external rewards: the decadent meal, the Botox, the designer shoes, the higher paycheck, and the more prestigious title. We look inside ourselves to see what really lights our fire, what really brings us peace. Please note that this probably isn’t about finding a more meaningful job. It’s about identifying the meaning that is already there. We humans find our calling in all types of work—as janitors and ministers, as executives and hairdressers, as artists and parents and mail carriers and farmers. One study found that among administrative assistants, one-third considered their work a job (they focused on their paycheck—not the meaning or enjoyment they derived from the work), one-third considered it a career (mostly a series of ascending achievements), and another third considered it a true calling (they felt that their work was interesting, socially useful, and truly worthy of their time and energy). Researchers have found the same results in other occupations. People tend to be more or less equally distributed in each of the categories of job, career, and calling. It isn’t the job description or title that determines meaning— whether we consider our work a job, a career, or a calling. It’s the person. It isn’t about the prestige or even the helping nature of our work. It’s about the meaning we personally find in it and express through it, and the effort and commitment we give to it. So what do you want people to remember? Think about what your friends and family will say at your funeral. What do you want them to say, and what would they likely say now? Now, take a step back and think about what meaning you find in your work, and in your life. What are you passionate about? What do you find most interesting, important, and worthy of your time and energy? What positive impact are you having on the world and other people? Do your time and effort reflect your commitment to the work you value the most? This is a first step towards discovering what you value, so that you can better prioritize your time. The next activity is about how best to prioritize. Share your thoughts about these questions in the comments below.